There are decorating styles – for example, country, Tuscan, coastal, and British Colonial – and there are furniture styles that suit those various decorating themes. Some of these furniture styles have been around for hundreds of years, while others are quite recent. Some were initially specific to a certain area or group of people; others had broad appeal from the start. Here are ten furniture styles often used in today’s decorating. Mid-century modern style first rose to popularity during the 1940s through the 1970s but has resurged to the decorating forefront recently, partially because of the show Mad Men. It’s a style marked by simple lines, furniture raised on legs, strong graphics, and geometric designs, and natural materials mixed with plastics and chrome. Mid-century furniture is typically unpainted wood, but molded plastic – often in bright colors -- and chrome frames or trim are quite common. This is a great style for a contemporary bedroom if it’s not overdone. If you’ve shopped at Ikea, you’ve seen Scandinavian modern, also called Scandinavian contemporary, furniture. It first rose to popularity during the same period as midcentury modern – the 1950s through the 1970s – and shares a similarly simple, unfussy vibe, along with a reliance on a neutral color scheme and natural materials, especially wood. The lines of Scandinavian modern furniture are straight, with little ornamentation or hardware, and simple platform beds – often without a headboard - are the norm in the bedroom. This style of furniture is usually found in a contemporary bedroom, but if you cover up the wood with a coat of paint, it also works with a coastal or country decorating theme. It might have started as a furniture style for the wealthy in the early-to-mid 1700s, but these days, Queen Anne furniture is a traditional, formal style for any bedroom. Dark wood with lots of curves turns, spindles and embellishments are typical, as are legs on all pieces of furniture. You’ll most often see a tall chest of drawers, rather than a dresser, in the Queen Anne bedroom. Look for classic ring-pull or batwing pulls in brass or burnished metal on the furniture drawers. As with most formal styles, this look works best with a matched set of furniture. Also called Arts and Crafts or Craftsman style, designers in the late 1800s through early 1900s created the Mission style as a rejection of both the mass-produced furniture that was just rising in popularity and the fussy, Victorian style that was already in vogue. 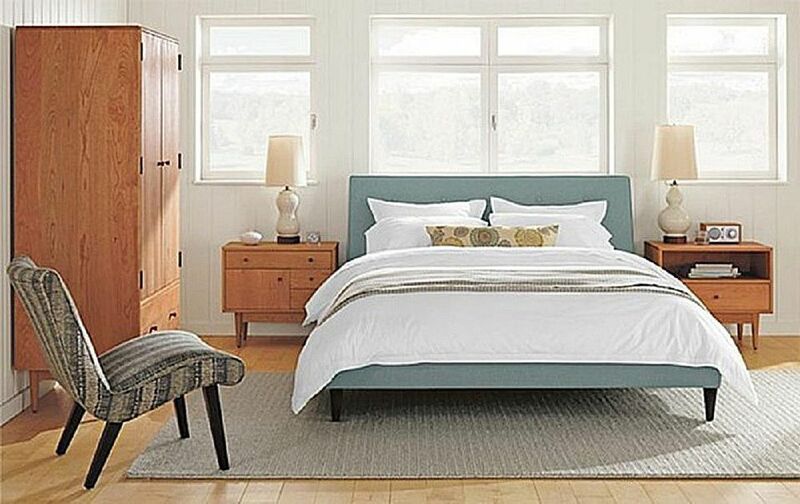 Simple, strong lines, often with narrow slats as in the bed shown here, characterize mission style furniture. The joinery, such as dovetailing on the drawers, is usually visible, and hardware is most often burnished or black metal. Typically, Mission furniture is made from light-to-mid-tone wood with visible grain. It’s especially at home in a Southwestern-inspired bedroom but works well with any casual decorating theme. If a furniture designer in the early 1900s decided to create furniture with a futuristic style, he might have come up with Art Deco. This style, which was tremendously popular in the 1920s, has lots of curved lines, geometric insets, glossy lacquer, mirrored insets, inlaid wood (as in the nightstand and dresser shown here) and an overall opulent, exuberant feel. Materials include wood, plastic, glass, and fabric. Lavish headboards and large, multi-piece mirrors are typical of the Art Deco bedroom. This is a style for anyone who loves luxury, romance or glamour. A marriage of traditional formality and contemporary simplicity, transitional furniture – also called updated classic -- is one of the most popular styles in today’s bedroom. It’s a balanced look—just enough curves and embellishment to create interest without being fussy or old-fashioned, but nothing extreme or overdone. Transitional furniture is not small and dainty, but it's not overwhelming, either. Wood is the predominant material, with finishes ranging from light to dark. The hardware is classic in design and used to add extra style to the furniture. As a neutral style, transitional furniture works with almost any decorating theme. When you hear “Adirondack,” your first thought is probably of the iconic wooden camp chairs. But there’s more to this rustic style than just chairs – it’s a lodge style with character to spare. Named for the Adirondack Mountains in New York, Adirondack style furniture has been popular for more than 100 years. You might not live in a log cabin, but if you love the natural, casual easy feel of the outdoors, Adirondack furniture is a perfect way to bring that feeling indoors. It’s typically made with logs, branches, and distressed wood, and has a one-of-a-kind, woodland feel. While the lines of Adirondack furniture are simple, the imperfections of the materials give it a unique, naturally ornate appeal. “Traditional” is an umbrella term used for many different styles of furniture popular in the 1700s through the 1800s. What modern-day updates on these antique styles generally share is a formal appearance, wood with dark finishes; plenty of curves, trim and embellishments; and a vibe that can be stodgy or old-fashioned if overdone. You’ll usually find legs on the furniture, classic hardware, ornate headboards and four-poster or high profile beds. British Colonial is one of the most popular decorating themes that work well with traditional furniture. Contemporary design is a fluid concept– it refers to the design trends most popular at any given time. Because of that, it’s not a set style, but rather, one that changes to embrace current tastes, lifestyles, and materials. Two styles having a great deal of impact on today’s contemporary furniture design are midcentury modern and minimalism – a movement towards “less is more” decorating and lifestyle. Because of that, you’ll find an emphasis on simple lines, long, low furniture, platform beds, and small or nonexistent headboards. Contemporary furniture uses a wide range of materials, including wood, metal, plastic, glass, and leather. Originally produced in the mid-1800s by the United Society of Believers -- more commonly known as Shakers -- as part of their simple, self-contained lifestyle, Shaker furniture soon attracted devotees outside their religious community. You won’t find ornate carvings, embellishments, fancy hardware or mixed woods in Shaker design, although back in the 1800s, the furniture was often painted blue, green, red or yellow. Today, however, Shaker furniture is usually left in natural wood tones. The emphasis on utilitarianism and simplicity gives the furniture a restful appeal, which is perhaps why it is still popular in country, colonial, or rustic bedroom decorating themes.